Christmas is coming up soon. And that means cookies. We bake lots of them at our house. But sometimes we need to lessen the sugar overload. Which this cookie does, with style. It has just enough sweetness to satisfy, but not too much. These cookies are great with tea or coffee, or with the classic glass of milk. They make a nice afternoon treat, too. Even your kids will like these. And you? Let’s call it love. This is a traditional Italian cookie, and is quite popular during the Christmas holidays. Mrs. Kitchen Riffs is the baker in our house. She adapted this recipe from one she found in Sweet Maria’s Italian Cookie Tray by Maria Bruscino Sanchez. Prep time for this recipe is about 15 minutes. Baking time adds another 45 minutes or so, depending on how many cookies you bake on each sheet. Yield is about 36 cookies. These cookies keep well for several days if stored in an airtight container. Arrange two metal racks in your oven, placing them about a third of the way from the bottom and the top. Preheat the oven to 375 degrees F (or 350 F for convection bake). Line your baking sheet(s) with parchment paper. Set aside. In a medium-sized bowl, whisk together the flour and baking powder. Set aside. Place the softened butter in the bowl of a stand mixer (or in a large bowl, if using a hand mixer). Add the sugar, then cream together until light and fluffy. Add the eggs and mix in thoroughly. Add ½ cup milk and the almond extract, then mix well. Gradually add the dry ingredients (flour and baking powder) and mix until well blended. Fill one small bowl with about ½ cup milk, and another small bowl with sesame seeds. Scoop out about a tablespoon of cookie dough and roll it into a ball. Dip the dough ball into the milk, then roll it in the bowl of sesame seeds until coated (see Notes). Place the dough ball on the prepared baking sheet. Repeat until you have used all the dough (place the cookies about 2 inches apart on the baking sheet). Press down gently on the tops of the cookies to flatten them a bit. Bake the cookies for about 12 minutes, reversing the baking sheet from the bottom to the top oven rack midway through. The cookies are done when they have puffed up and are beginning to brown. Don’t overbake. Remove the cookies from the baking sheet and cool them on a metal rack. 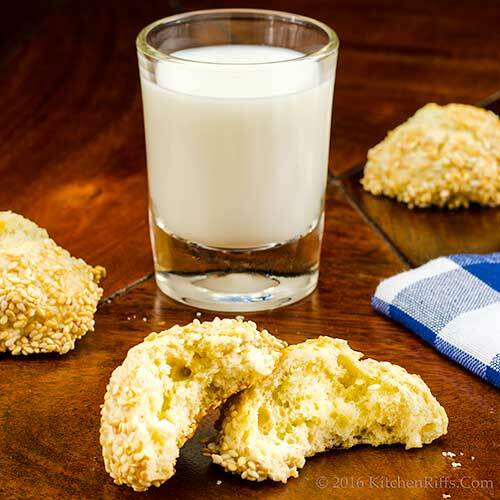 These cookies are sometimes called “Biscotti di Regina” in Italian (the name translates as “Queen’s Cookies”). They’re also known as “Giugiuleni” (especially when you form them into a crescent shape). Baking powder does become weaker over time (and most baking powder tins have an expiration date). So replace your baking powder when necessary. We usually replace ours once a year, when daylight saving time ends (so we remember to do it). It’s a good idea to shake baking powder before using to make sure all its components are well mixed. Baking powder consists of baking soda, plus an acidic ingredient (which reacts with the baking soda to produce leavening), along with a neutral substance (usually corn starch) to provide bulk. Eggs carry a slight (but real) risk of salmonella. So we suggest using pasteurized eggs for cookie dough. Although it’s unlikely that the eggs you buy will be infected, why take the risk? Especially since most of us can’t make cookies without tasting the raw dough. We like to use almond extract in this recipe, but anise extract is also traditional. Or you could use vanilla extract if you prefer. Sesame seeds can be expensive if you buy them in the little jars typically sold at supermarkets. So we like to buy them in bulk, generally from an online source. Why dip the cookie dough dollops in milk before rolling them in sesame seeds? Because the milk coating helps the seeds adhere. About overbaking: It’s all too easy to do. So, if in doubt, underbake instead. Cookies (and other baked goodies) dry out quickly if you bake them just a bit too long. “A nice cookie for grownups,” said Mrs K R.
“You’re a smart cookie,” said Mrs K R.
“But not too smart?” I said. “Sesame,” said Mrs K R.
I'm always amazed at the flavor of sesame, I bet these cookies are fabulous ~ I wonder if they would work with black sesame seeds, too? I have both in my cupboard. I love seedy cookies! And with just 1/2 cup of sugar, I would even call these delicious cookies HEALTHY!! Hi Sue, haven't tried this with black sesame seeds, but I'll bet they'd work. Definitely worth a try! Thanks for the comment. Hi Angie, yup, healthy, that's what these are! :D Thanks for the comment. I have never heard of these cookies, but they look and sound delicious! We go cookie crazy at my house all year long, but it's madhouse during Christmas time :) Will definitely have to give these a try! I love sesame seeds so I am sure I would love these cookies. Yum! Hi Marcelle, these are wonderful! You'll enjoy them -- super flavor. Thanks for the comment. Hi Pam, they're such a nice cookie -- bet you would love them. :-) Thanks for the comment. Hi Amira, sounds like you don't have to worry about your baking powder becoming stale! I've had a version of this cookie that had honey in it (in North Africa). Good combo. Thanks for the comment. I've always wanted to try these because 'sesame' anything is wonderful! You two are just too cute! Says me! Hi Tricia, says you? 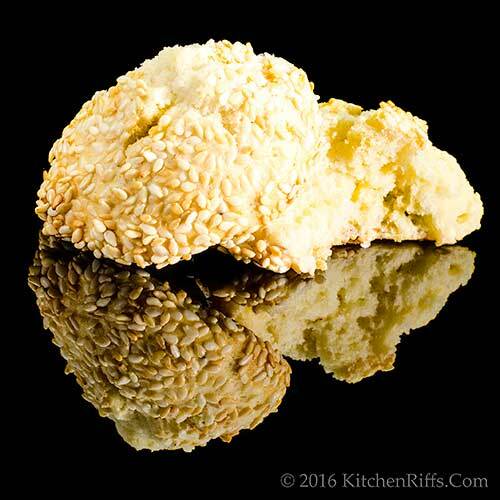 :-) If you like sesame, you'll totally adore this cookie. It's terrific! Thanks for the comment. A good friend bakes these for me every year and I adore them -- not too sweet, just sweet enough. The deal is I buy her the sesame seeds, she bakes. Since I'm the only one who likes them, I've learned they freeze very well, too. Thanks to Mrs. KR! Hi Rosemary, these do freeze well. Not that we ever have any left over. :-) Thanks for the comment. Ahh, milk and cookies- what a comforting treat! Reminds me of when I was a kid and would come home from school for a treat of milk and cookies.These cookies would certainly fit the bill! Hi Fran, milk and cookies really do pair well, don't they? :-) Thanks for the comment. My mouth waters just looking at these cookies - they're perfect for coffee dunking! I'm not a big sweet fan, so I love that they're lightly sweetened too. It looks so delish. Santa will be happy to gobble them! Me too! Ses a me these sound fantastioco. Just saying says a me. I adore cookies of all kinds. You might say I am politically correct in the cookie world. Thanks John. These cookies are just right for me, great to dip in tea or coffee. Hi Kristi, these are really nice for dunking. Ask me how I know. :-) Thanks for the comment. Hi Denise, both you and Santa will love these! :-) Thanks for the comment. Hi Abbe, very important to be politically correct when it comes to the cookie world! :-) Thanks for the comment. 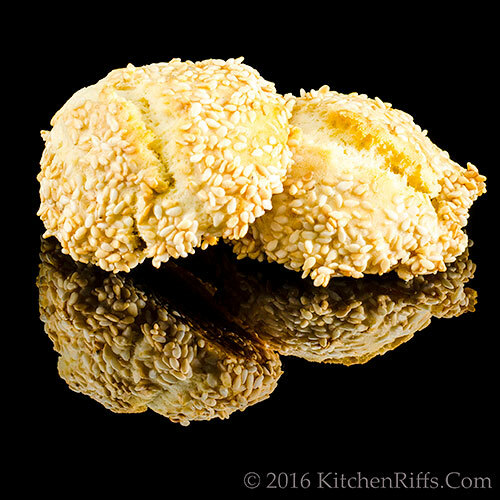 Sesame cookies are also a Chinese treat, though maybe even less sweet than yours. My bulk sesame seeds are from the Whole Foods bulk section-- maybe less expensive than online (unless there's free shipping). Hi Liz, sesame seeds are SO good, aren't they? And wonderful in this cookie. :-) Thanks for the comment. Hi Gerlinde, we like these with both of those! Or all by themselves. :-) Thanks for the comment. Hi Mae, we should check out the Whole Foods bulk goods! We do get free ship, but that sounds even better. Thanks for the comment. 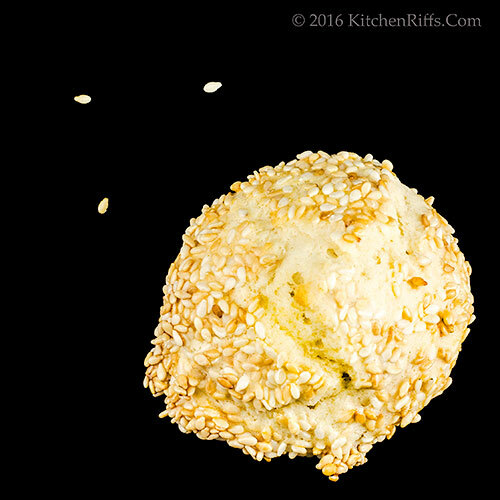 Sesame is one of my favorite in cookies and desserts. This sounds and looks so so good. That crumb looks beyond perfect. These remind me of an Egyption cookie I had once. I absolutely like that it's low in sugar and can't wait to try it out sometime. Yay to cookie season. I am not sure I have ever seen sesame used s intensely in an Italian treat! Very cool cookie and will have to try this one. Thanks for sharing! Hi Awesome Sauce, this are delish -- bet you'll like them! Thanks for the comment. Hi Evelyne, these do call for a load of sesame seeds! Which makes them SO good! Thanks for the comment. These remind me a lot of pignoli nut cookies. I made them a few times but ate far too many; now I only buy small quantities at my local Italian bakery. I think I'll have the same problem with these but I'm still going to try them anyway. Hi Jeri, I know that cookie! And these are somewhat similar, particularly when it comes to eating too many. :-) Thanks for the comment. Hi Merryn, aren't these neat? Wonderful flavor, and I love just the hint of sweetness. Thanks for the comment. Hi John, please tell Mrs. KR her cookies look wonderful, love cookies like these, they remind me of a cookie my mother-in-law used to make, delicious! We adore sesame sweets! These cookies would make a wonderful addition to our annual baking marathon! Hi Cheri, these taste every bit as wonderful as they look! :-) Thanks for the comment. Hi Deb, baking marathons are fun, aren't they? About the only kind I'll "run" these days! :-) Thanks for the comment. Give me a cup of sesame seeds and I will eat them straight up! Hi GiGi, they're good, aren't they? :-) Thanks for the comment. Hi Anna, terrible to be without a kitchen! You'll be dreaming of making these, I'm sure. :D Thanks for the comment. HI Natalia, they were good! Need to make another batch. :-) Thanks for the comment. Hi Shannon, we always seem drawn to the seedy. :-) And these cookies are wonderful! Thanks for the comment. Hi Greg, we've never met an Italian deli or bakery that we didn't love! And always buy something. In fact, we first tasted this cookie when we bought some at a bakery in the NYC area. Thanks for the comment. I love the sound of these seedy, Italian gems! The almond flavoring sounds terrific! Hi Liz, these really are great cookies. They've become one of our favorites! Thanks for the comment. While reading your recipe, I immediately thought of Amaretto Cookies, don't these taste similar? You come up with such beautiful creations. Hi Nisha, these are definitely similar, particularly if you use anise extract instead of almond. Thanks for the comment. Love a cookie that's not too sweet. And with the sesame seeds, could we say that they're actually good for you... ? I'm with you about that sugar load. Thanks for a savory option to add to my list. Hi Anu, you can have a dozen. Right after we bake another batch. :-) Thanks for the comment. Hi Frank, of course we can say they're good for you! At least that's our story, and we're sticking to it. :-) Thanks for the comment. Hi Lea Ann, sugar can be fun, but too much is too much. And easy to get too much at this time of the year! So these are a big help. :-) Thanks for the comment. I LOVE sesame cookies. There's something so wonderful in their simplicity. They really let the delicate nuttiness of the sesame seeds shine through. Hi Carolyn, this is such a good cookie, isn't it? Always forget how good they are until we make a batch. Then can't get them out of my head! Thanks for the comment. I do't recall ever having these cookies but they sound wonderful! I have plenty of sesame seeds so I'll have to give these a try. These are a new cookie to me! They look terrific and I like that they aren't overly sweet when there are so many sweets this time of year. Hi Vicki, I think you'll really like these -- wonderful flavor. Thanks for the comment. Hi Amy, these ARE terrific! Wonderful flavor, and we like the fact that they're not too sweet, too. Thanks for the comment. I love these cookies, John. My mom used to make them every holiday. However, just let it be our little secret..my favorite way to eat these is for breakfast with a strong cup of coffee...its the breakfast of champions! Hi Bobbi, these would make a wonderful breakfast! Great idea. :-) Thanks for the comment. What a unique cookie! It will definitely stand out from the pack this holiday season! Hi Laura, it's a good one, isn't it? SO flavorful! Thanks for the comment. Looks really yummy, I'd love to give it a try. Pinned! Hi Amalia, it's a great cookie -- bet you'd love it1 :-) Thanks for the comment. Hi Judy, the texture of these is amazing! All those seeds! :-) Thanks for the comment. They look delicious! Funny, most people just make sugar or chocolate chip cookies, but there are so many options! Hi leebakers, there really are a lot of cookie options out there, aren't there? And we mean to try them all! :-) Thanks for the comment. Hi Charlie, too much over-indulging around our place, alas. Well, we can watch our diets next year. In the meantime, cookies! :-) Thanks for the comment. Now this is a cookie I can totally get into, but the question is almond or anise, I love them both! I even have all the ingredients on hand! Not that I don't have enough to do. But they are definitely calling my name! Hi Eva, the only solution is to make two batches -- one with almond, the other with anise. So you can taste and compare. :-) Thanks for the comment. We usually buy these from the store, but why should I do that when you made them look so easy?! I need these! Hi Pamela, you do need these! :-) Thanks for the comment. Great suggestions about baking powder. I must admit I never pay attention to the expiry date, although I do a lot of baking and it's doubtful mine ever actually expires. Hi Beth, we usually go through baking powder quickly enough, too, but not always. Always a good thing to check! :-) Thanks for the comment. I think I had this before and I do love them with milk. Hi Raymund, most cookies taste good with milk, don't they? :-) Thanks for the comment. cookies with just right amount of sugar sound definitely good! Hi Marta, these are good! And super for breakfast. :-) Thanks for the comment. I always love Italian cookies, and now I'm very curious about the book! Love that these are lower in sugar too. Can't wait to get baking for the holidays. Hi Lisa, it's a neat cookbook! You'll like. You'll like these cookies, too. :-) Thanks for the comment. Not sure if I've ever had these cookies which is surprising in that I've never turned down any type of cookie. They are my weakness for sure. Such beautiful little cookies and love the flavors of sesame and almonds. Thanks Ms. Riffs! Hi MJ, bet you'd love these! Really wonderful flavor and texture. One of our favorites. :-) Thanks for the comment. Sesame cookies are really popular in Japan too, and it's so fun to see Italian loves cookies with sesame seeds as well. The nutty flavor is so good and I love that it has some savory taste to it. I can't believe holiday season is here. We had one sick child and now another one tonight. It looks like I'll be indoors and try the Italian sesame cookies this year! I love sesame and almonds so that makes these cookies a win win situation for me! I much prefer adding less sugar to my homemade biscuits; love the sound of these. Oh, now these are my kind of cookie! Love that it's not too sweet and the sesame seeds are definitely for grown-ups, lol. Beautiful! Hi Helene, I'm pretty sure this cookie does come from the south of Italy, perhaps Sicily. And we like that it has less sugar too! Thanks for the comment. Hi Nami, the holiday season is on us so quickly, isn't it? Hope your kids get well soon! There's been something nasty going around. These cookies will definitely help. :-) Thanks for the comment. Hi Katerina, the flavor of these is wonderful -- we love them! Thanks for the comment. Hi Caroline, we like sugar, but less is definitely the way to go. These are wonderful! Thanks for the comment. Hi Robyn, although I think most kids will like these OK, this cookie wouldn't be their first choice. But it's perfect for adults! Thanks for the comment. This just the kind of cookie that is perfect. Not too sweet, and perfect with a really good cup of hot coffee. Love this recipe. Hi Velva, it really is a nice cookie. Really nice with coffee, too. :-) Thanks for the comment. These cookies are new to me. They look wonderful. I would love to have a couple with a cup of tea. Hi Dawn, these are great for dunking in tea! And really good all by themselves. :-) Thanks for the comment. This is so yum. I am a fan of anything sesame! Mrs Yi Reservation is also the baker at home (with exception to bread) and she'll love to give the recipe a try. Thanks for sharing. Hi Yi, I'll bet Mrs YR will really like making these cookies -- it's a fun recipe. Even more fun to eat. :-) Thanks for the comment. I love classic, old-world cookies for the holidays. This one is going into my lineup. Thanks! Hi Jeff, you'll love this! A real adult cookie. Not that either of us know any actual adults, of course. :D Thanks for the comment. I am intrigued with these cookies...almond and sesame...and they sure look fluffy...please thanks Mrs. Kitchen Riffs for the recipe. Hi Juliana, these are wonderful cookies -- such a nice combo of flavors! Thanks for the comment. Hi Rosa, mmm, cookies and Vin Santo! :-) Thanks for the comment, and Happy New Year! My grandma made seed cookies every year at Christmas. She was Italian by way of marriage :) Alas, I never got her recipe. In the last ten years I've found many sesame seed cookie recipes online and eventually settled on one that used orange zest and vanilla rather than almond extract. I always thought my Nana's cookies were lemony flavored, but maybe my young palette mistook almond for lemon. I going to give your recipe a try just to be sure! Another note, I mentioned to my family on Christmas Eve that I made these cookies but didn't bring any to share because I was pretty sure no one else liked them. Boy was I wrong! Lots of indignant "I love those!" "Those are my favorites". Lesson learned. Thanks for sharing. Hi Denise, these have become one of our favorite cookies! Might be interesting to try this recipe with some lemon zest added -- I like that idea! But I LOVE lemon! :-) Thanks for the comment. I really love Italian cookies (we lived there for a few years and I think I love Italian bakeries more than I love French bakeries); they are simple, not too sweet, and aren't too rich or gooey, and with only a hint of a flavoring, almond or vanilla.... the perfect treat to eat with coffee or a glass of wine. I must make these! Hi Jamie, you'll love these! You could even serve them to your breakfast guests. :-) Thanks for the comment.